An incorrect story has been making the rounds in recent months quoting George Bush Senior as stating Americans can't handle the truth about UFOs. A bit of fact-checking demonstrates the item to be false. Perhaps equally as important is the manner such inaccurate information is cultivated without conscience in the UFO community by the very sources claiming to provide reliable reports. Paranormal-themed blogs, news sites, discussion forums and similar venues began carrying reports late last year of George H.W. Bush fueling the conspiracy fires while attending an event held in Orlando. It was allegedly a fundraiser for the attempted presidential run of his son, Jeb. As the story went, Papa Bush was asked about UFO disclosure, and he responded that we can't handle the truth. Those who picked up the story included George Filer of Filer's Files, a writer and monthly column long highlighted by such organizations as the Mutual UFO Network (MUFON) and the National UFO Reporting Center (NUFORC). Filer was a speaker at the 2012 MUFON Symposium in spite of such questionable circumstances as selling lights he claimed cured the flu. Filer became one of many repeating the Bush story when he did so in Filer's Files #52, published in December, 2015. He credited Your News Wire as his source for the info. Suffice it to say it did not take a seasoned detective to identify the story as false. No more was required than a laptop, a few minutes to conduct some searches, and a willingness to ask a few questions. Where did Your News Wire get the story? Where, exactly, did this event occur? Can the people in question be confirmed to have actually been there? Such are the basics - who, what, where and all that stuff - we might initially ask about any story. If writers appear to conceal and obscure such details, or simply fail to report them, we should question why. That's it. That's the source of the story, a website that openly states its content is fictional and suggests any resemblance to actuality is miraculous. The WNDR article did not have a date, but comments posted suggest it ran in October or thereabouts, obviously prior to the Your News Wire article that linked to it. None of the versions of the story included any details about the supposed venue hosting the alleged fundraiser. 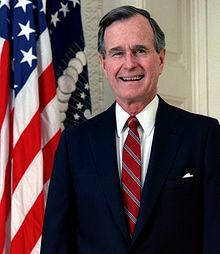 Furthermore, if Filer or other writers who ran with the story - with or without knowledge of WNDR as the source of the Bush quote - had so much as briefly checked what the Bushes were doing during the time in question, they would have easily discovered conflicting information. A Florida Politics post, dated September 12, 2015, reported upcoming fundraisers involving the Bush family. Former First Lady Barbara Bush was scheduled to be at an event in Greater Orlando on Oct. 8, for instance, and former President George W. Bush was raising funds in New York, Texas and Arkansas. An Oct. 25 event in Houston was scheduled to include George W. and his father, George H.W. Bush. No mention whatsoever was made of an Orlando event involving Jeb and/or Bush Senior. I'm not convinced WNDR is the most negligent party in such chains of events. Sure, it's a click bait site and, no, I don't condone the venture, but it is legal and appears to be the prerogative of such sites. We might not agree with the ethics and intentions, but maybe we should hold our community members to the same standards we would so quickly impose on a website like WNDR - that openly admits its stories are false if we bother to read what it posts about itself. I'm much more concerned with self-described investigators who selectively parrot what they hear and subsequently contribute to the manipulation of the UFO community. Am I to think this is the extent they vet their often celebrated witnesses? ...and why shouldn't I suspect swallowing such stories hook, line and sinker is indicative of gullibility, lack of critical thinking and poor research skills? Isn't that a reasonable opinion to surmise? It is challenging to express the extent I think this applies to ufology. The harm, as I see it, is the wholesale exploitation of a demographic of people: those willing to be open-minded enough to explore reports of UFOs and related phenomena. It is perpetrated all too often by the very organizations and investigators claiming to advocate for them. When unverified story is piled on top of unverified story year after year after year, it becomes extremely difficult to resist the resulting conditioning. Such resistance is now required, however, in order to look at reports with fresh eyes and explore them without biased, preconceived conclusions. The damage has long been done and there are many who fail to see anything wrong with it or even identify it as damage. I would argue that if we don't make an intentional effort to prioritize actuality, we never even give ourselves a chance to understand what takes place. I invite consideration of subjecting our community members to the same criticisms when warranted as we would satire sites. Failing to do so has resulted in decades of detrimental conditioning, the likes of which have solidified passionate beliefs built upon the shifting sands of quantity prioritized over quality. In September of 2015 I did a blog post summarizing the case of Jeffrey Alan Lash. Readers will recall a Los Angeles attorney alerted LAPD in July that the corpse of Lash was located in a vehicle parked in Pacific Palisades. The resulting investigation included increasingly strange circumstances reported in the media, involving the discovery of excessive amounts of weapons and cash, as well as tales of Lash being an ET-human hybrid working undercover for the CIA. Follow up efforts to learn more from LAPD hit a dead end. Further inquiry revealed the Department would not be releasing files on the Lash investigation. The initial post has consistently received traffic. Week in and week out, regardless of what is cycling in the news and what is discussed around ufology, the summary of the Lash case receives anywhere from a hundred to several hundred views per week, now making it the second most viewed post ever on The UFO Trail. For whatever reasons, and a year after the story first broke, people remain interested in the bizarre chain of events, at least in proportion to other genre-specific cases. Website traffic logs indicate the visitors originate from IP addresses at universities, libraries, hotels, offices of state and city government - pretty much anywhere one might get on the internet. The traffic is also international, as our peers in Australia, South America and Europe, among other locations, appear intrigued by events surrounding Lash. Visitors also include IP addresses assigned to United States federal agencies, including locations both domestic and abroad. Traffic logs suggest visits specifically to the post on Lash repeatedly occurred from multiple offices of the Department of Defense and the Navy Network Information Center, as well as IPs assigned to the Department of Homeland Security and Department of Justice. I do not offer explanations as to why the Lash saga draws such interest. I'd imagine there are lots of different reasons. One dynamic I have pondered and will offer for consideration is, when a story gets legs, any number of demographics might desire to further understand and duplicate that interest. Such demographics might range from writers and Hollywood executives to intelligence analysts who specialize in propaganda and the accompanying social media operations. While the popular interest in the Lash story, and how such interest might be intentionally cultivated, could indeed seem a worthy object of attention, the reverse dynamic might also deserve its share of consideration: Minimizing publicity and the resulting impact of a story. There is a trial currently taking place, little discussion as it may generate in most circles, that involves involuntary human experimentation conducted by the American intelligence community. It's the Guantanamo war court. Implications include the use of non-lethal weapons, or at the least such claims are being made. Incorrect claims might result from effects of trauma in some instances, among other reasons. Procedures used, widely known as "enhanced interrogation techniques," have caused permanent impairment, extreme trauma and death. "incommunicado for the remainder of his life"
Testimony includes statements that "noises and vibrations" are directed at prisoners as part of a psychological operation. Closed circuit television of the trial provided to journalists is intermittently turned off for security reasons. Moreover, extreme involuntary human experimentation was documented, among other sources, in the relatively recent Seton Hall University School of Law report, Guantanamo: America's Battle Lab - and the existence of Gitmo is hardly an isolated incident. Prison Legal News, a project and publication of the nonprofit Human Rights Defense Center, reported in 2015 that some 54 nations were complicit in the operation of secret CIA prisons. Sources included reports from the US Senate and the Open Society Justice Initiative. Numerous international legal cases developed, with rulings leveled against the CIA. I devoted a chapter to such circumstances in my book, The Greys Have Been Framed: Exploitation in the UFO Community. The chapter is titled 21st Century US Illegal Human Experimentation. Furthermore, a career intelligence officer, one frequently invited to speak as an expert at UFO-related events, asserted mind control was "coming back" - nine years ago. He added that technology would enable modification of the behavior of enemies, specifically citing those held at Guantanamo, via electronic means. "We're now getting to where we can do that," John Alexander stated during an interview published by The Washington Post in 2007. I'm not suggesting all the claims, by either prisoners or intel officials, are entirely accurate. Neither am I necessarily suggesting all of it directly applies to events within the UFO community. Those are other issues for another time. What I'm inviting readers to consider is that fringe-themed websites, which devote substantial content to either supporting or criticizing such topics as CIA-employed hybrids, UFO cover-ups, and advanced alien technology, take such little interest in what's happening at Gitmo and other black sites. Many of the circumstances are readily accessible via declassified reports, as well as credible sources, such as those linked above, which analyze those reports. Nonetheless, members of the UFO community typically seem uninterested or poorly informed about the activities and scope of the intelligence community. Meanwhile, for each of you who will read and consider the contents of this post, several hundred more will read about Lash.